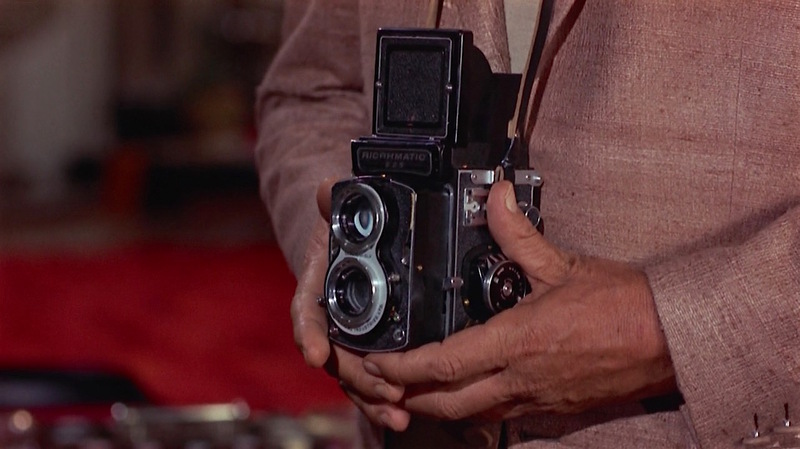 No longer an active agent in the employ of the American agency Intelligence and Counter-Espionage (ICE), Matt Helm spends his days as a philandering photographer more comfortable with shooting photos than shooting bad guys. An early scene in The Silencers finds Matt returning from a shoot one evening, dropping ice cubes into his J&B—Dean Martin’s preferred Scotch in real life—when he spots a woman’s discarded clothing leading to the bedroom and comments to himself: “Treasure hunt!” The hunt leads to his discovery of Barbara, a heavily made-up blonde bombshell clad only in one of his tuxedo shirts, who claims to have been sent by his former boss at ICE to try to convince him to report back to duty instead of heading to Acapulco the next day as he had planned. Barbara: What’s in Acapulco that you can’t find here? Matt succumbs to the woman’s charms, but—luckily—exotic ICE agent Tina (Daliah Lavi) is there to save him from Barbara with three .22-caliber rounds to the blonde’s back. She reveals that Barbara was a potential assassin sent by the “Big O” organization, proven by the signature bullets in the .38 packed in Barbara’s purse. 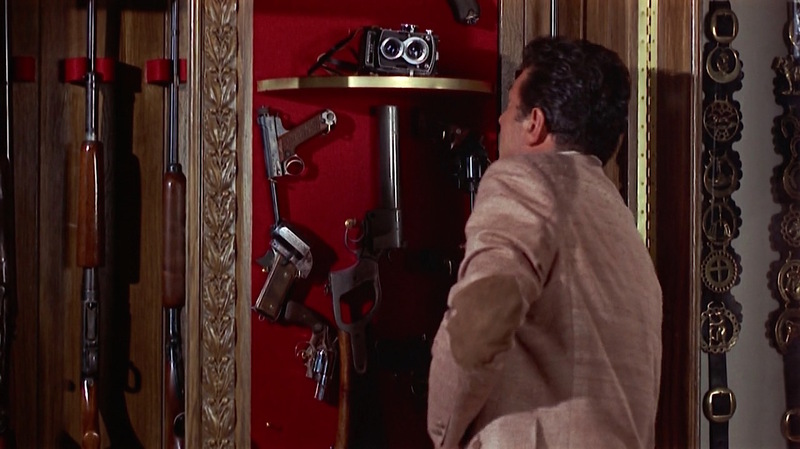 Matt succumbs to the woman’s charms, but luckily the exotic .22-wielding ICE agent Tina (Daliah Lavi) is there to save him from Barbara, revealed to be a potential assassin sent by the Big O organization, proven by the trademark bullets in the .38 packed in her purse. Daliah Lavi would prove to be the queen of mid-sixties spy spoofs, appearing the following year in Casino Royale (1967), the Charles K. Feldman-produced parody of Ian Fleming’s first James Bond novel, as well as The Spy With a Cold Nose (1966) and Some Girls Do (1969). Tina convinces Matt—here invoking his code name “Eric” from the original Donald Hamilton novels—to return to working for ICE rather than just putting it in his drinks. After the two subdue even more enemy agents outside Matt’s home, the two are on the road to Phoenix in his big Mercury Colony Park “woodie wagon” while we’re treated to a non-diegetic version of Dino crooning “South of the Border” with modified lyrics lamenting that he most postpone his trip to Mexico. 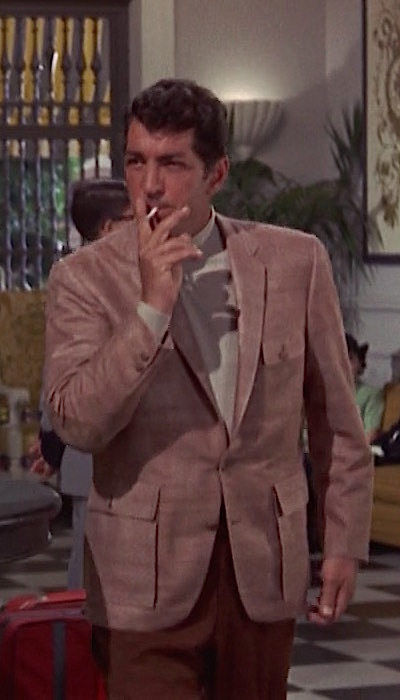 Dean Martin’s first on-screen outfit as Matt Helm, aside from the red turtleneck and gray slacks from an earlier dream sequence, is a pink raw silk sport jacket over a beige roll-neck jumper with brown trousers and brown suede boots. While many gents may be insecure about wearing a pink silk sports coat, Dino pulls it off with the self-assured confidence of anyone else in a sharp gray suit or a classic navy blazer. It helps that the jacket is nicely tailored, no doubt a product of Sy Devore, the legendary “tailor to the stars” who was Hollywood royalty up to his death in 1966. The jacket has khaki shank buttons on the cuffs, pockets, and front, where the top of the two buttons fastens perfectly where his tucked-in turtleneck meets the trouser waistband. 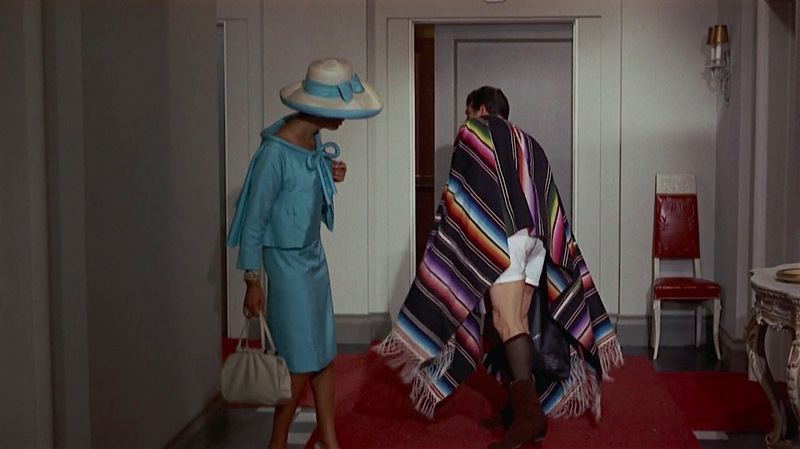 Matt Helm gets home and promptly reaches for a bottle of Scotch. 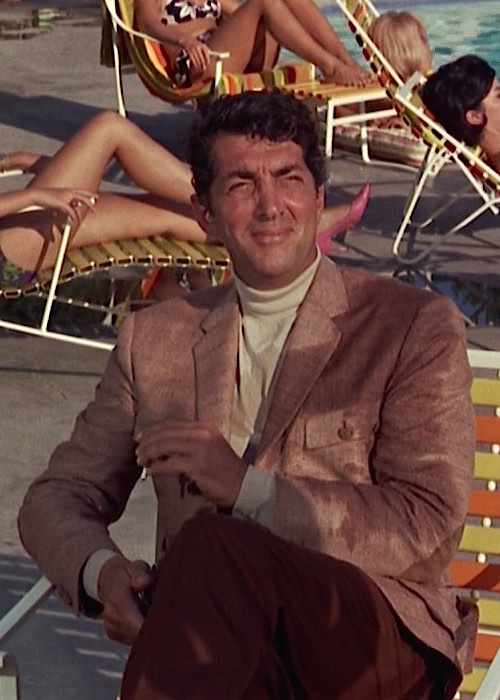 Dean Martin’s influence on the character is very thinly veiled, indeed. Distinctive for its nubby matte finish and light-wearing open weave, raw silk is a luxurious warm-weather alternative to shinier, heavier silks and more resistant to wrinkling than linen or cotton, making it an ideal fabric for a swingin’ cat like Matt Helm who spends his days and nights in the warm southwest climate and always needs to look his best should a woman sneak into his apartment and leave her discarded underwear lying around. Matt’s double-vented jacket has four external pockets, all closing with a single button through a rectangular flap. The two breast pockets are set-in, the lower hip pockets are billows-style. The elbows are reinforced with khaki suede patches that coordinate with the buttons on the front, pockets, and two-button cuffs of the sport jacket. Only a blonde bombshell can get Matt Helm to turn his back on a bottle of Scotch… luckily for us, as this shows the sporty details on the sides of the jacket like suede elbow patches and bellows pockets. Matt wears a beige turtleneck in a soft, lightweight fabric, likely a fine gauge silk knit or a cashmere blend. The jumper has a full polo neck and is elasticized at the cuffs. Matt wears a pair of chocolate brown flat front trousers. The plain-hemmed bottoms are slightly flared to accommodate his brown suede boots, which fasten with a brass zipper on the inside of each boot. Sadly, Matt’s luxurious leisure outfit gets ruined upon encountering the klutzy Gail Hendricks (Stella Stevens) at the Phoenix hotel pool, first when she dries off in front of him and splashes him his water and—more definitively—when she spills her Bloody Mary all over him. Not only does Matt expose his white cotton boxer briefs, but we also see his knee-high dress socks made from a thin dark brown silk to coordinate with his trousers and boots. Gail: Can I buy you a drink? I feel I owe you one. (to Tina) I’m sure I owe you one too. I’d really feel better if you’d accept. Matt: Thank you very much, I’ll have Scotch and soda, and she’ll have aquavit on the rocks. Gail: (eyes her own Bloody Mary) Hm. I’ll have to try that. Unpretentious, timeless, and smooth, J&B is a fitting choice as Dean Martin’s favorite. He was reportedly a lifelong Scotch drinker, having favored mainstream brands like Black & White or Haig & Haig during the early days of his fame, according to Ciro’s nightclub proprietor Herman Hover in Iain Russell’s profile for scotchwhisky.com. However, Dean followed the fashionable set in the late ’50s and, by the time he was a full-fledged member of the infamous Rat Pack, a bottle of J&B and accompanying rocks glass were an ever-present part of Dean’s stage act. 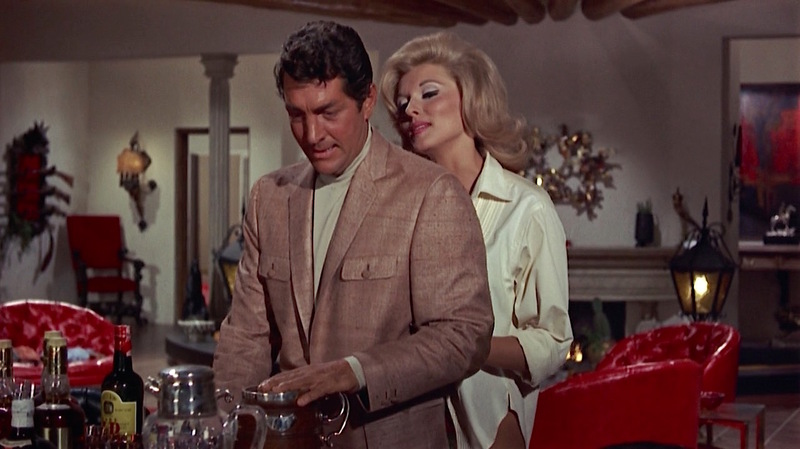 Booze and blondes: the Dean Martin image in a nutshell. Of course, it’s now well-known that his act was just that… an act. The glass of booze served as an effective prop for Dean to build his laidback stage persona, though there were many occasions where the glass itself was reportedly full of apple juice rather than Scotch. He certainly imbibed off-stage, but not with the recklessness of his fellow Rat Packers like Frank Sinatra or Sammy Davis Jr. Instead, it was Dean’s fondness for smoking that led to his end. Loyal to his Kent King Size cigarettes—naturally, also Matt Helm’s choice—Dino was diagnosed with lung cancer when he was 76. Just over two years later, on Christmas 1995, Dean Martin died of emphysema in his Beverly Hills home. The lights of the Las Vegas Strip were dimmed in the entertainer’s honor. Matt also grabs a second snub-nosed .38 revolver for himself, tucking it into the left side of his trouser waistband. Although Matt arms himself with a .38, the first weapon that he actually uses is a customized Richomatic 225 camera, modified with a double-barreled dagger-shooting action that would make Q proud. Matt Helm’s Richomatic 225 gives a whole new meaning to the term “photo shoot”. The Richomatic 225 6×6 TLR camera was introduced by Ricoh in 1959 as an evolution of their earlier Richoflex Diacord L.
While we’ve seen James Bond in pink shirts and pink ties, Matt Helm is the ’60s spy with enough moxie to attempt—and successfully pull off—wearing a pink sports coat. 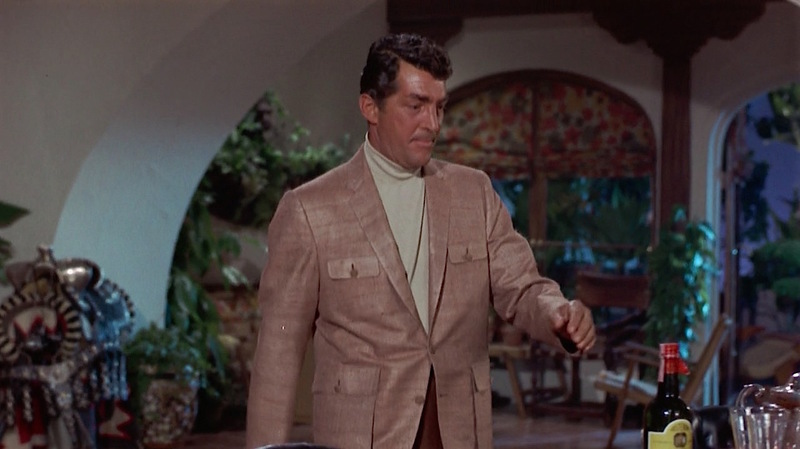 Dino’s also wise enough to let the jacket be the flashiest of his garb, neutralizing it with a beige roll-neck and plain brown pants as well as a pair of cowboy-inspired boots that reinforce his position as the all-American alternative to agent 007. Check out the movie or the whole four-film Matt Helm series. 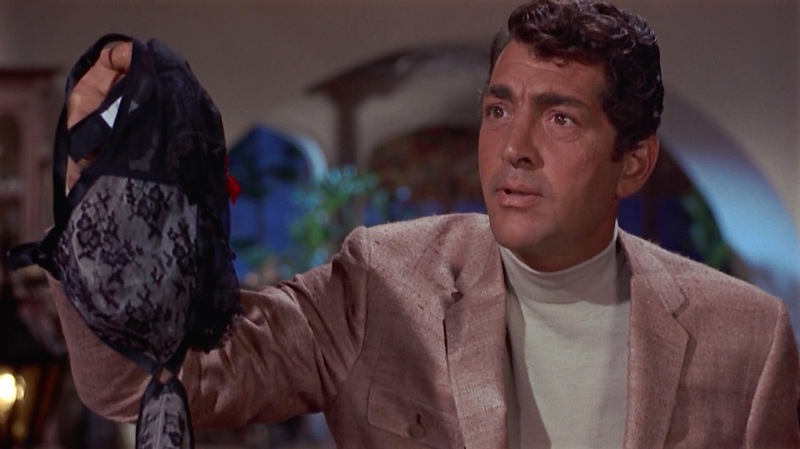 A pleasure to read this article about a Dean Martin character I’ve enjoyed since these films first came out. Wow! I love this sportcoat! I need to check out the movie. Thanks for the post. I recently reviewed the first Helm book, “Death of a Citizen”, and lamented what the filmmakers did to the Helm character. That being said, I sure love these Helm films! Thanks for this excellent entry – it was very well done! 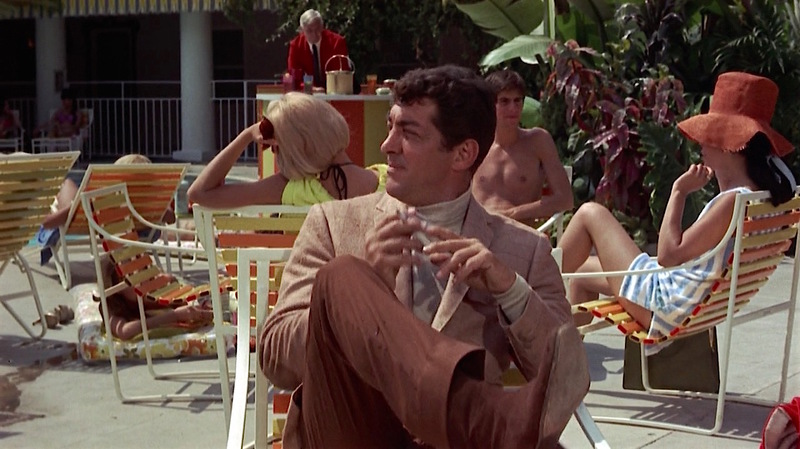 The Dean Martin/Matt Helm movies are very fun and extremely swinging sixties (I especially like his bed). This clothing combination was a great choice to write about too, because there are so many, like the red sports coat/yellow turtleneck he wears in the Ann Margaret movie.